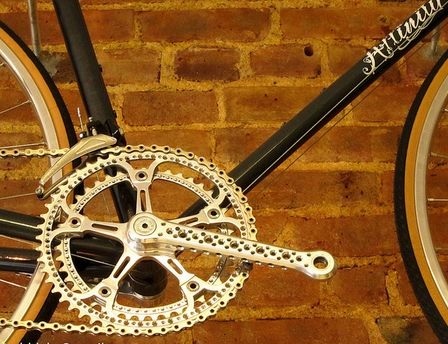 This chainset goes with the RD above. Done right, it's quite pretty, even if you would never consider actually using it. If that's a NOS Super Record crank, it seems like a waste of a nice piece of gear. Is that a Zeuss? I recall long ago (holy cow, I realize by that I mean 30 years ago) seeing one of those, the group of which was basically a Spanish clone of Campy Record or the like, all drilled. It was a very pretty bike, but practicality won, and I ended up with a Cannondale with Superbe Pro parts, which served me well for many years. As for the previous crank, if it is a Super Record, I'm not sure how much I'd trust it. I was never the hottest of hotshot cyclists but I cracked my SR cranks without any holes in them. That is Campy, Record I guess, on a Colnago Eddy Merckx Special, factory drilled. You can see the Clubs drilled into the big ring. There is a poster of Eddy at the TdF with a similar bike. I have ridden the bike (though not big miles) and love it. That's definitely Campy Nuovo Record. And notably without the crank being swiss cheezed out like in Sparky's pic.